A study published in Endocrine Society depicted how missing 30 minutes of sleep each day can have some long term metabolic effects – equated to weight gain and being 72% more likely to be obese! Researcher Dr. Shahrad Taheri explained, “Our findings suggest that avoiding sleep debt could have positive benefits for waistlines and metabolism and that incorporating sleep into lifestyle interventions for weight loss and diabetes might improve their success." A study in the American Heart Association looked at over 47,000 adults and found that those that slept less than 5 hours a day had 50% more coronary artery calcium compared to people who slept 7+ hours! Not only that, sleeping over 9 hours correlated to 70% more coronary calcium than those who slept 7 hours! Researcher Dr. Yoosoo Chang helped to explain, “Overall, we saw the lowest levels of vascular disease in adults sleeping seven hours a day and reporting good sleep quality." Going to Pull an All-Nighter? Think Again! Research in eLife found that all-nighters may have the opposite effect of what you want them to if you are trying to remember and retain as much information as possible. Research on flies indicated that when your brain goes into memory consolidating mode it inhibits wakefulness – aka making you sleepy! This is basically saying that our brain consolidates memories when we are sleeping. Therefore the best study/memorization tactic might be to learn something complex and then take a nap! Sounds good to me! Grad student Bethany Christmann weighed in, "It's almost as if that section of the mushroom body were saying 'hey, stay awake and learn this.’ Then, after a while, the DPM neurons start signaling to suppress that section, as if to say 'you're going to need sleep if you want to remember this later.’"
Research published in SLEEP found that those who sleep fewer than 6 hours per night are four times more likely to catch a cold (when they were exposed to the virus). Basically, sleep is incredibly vital in helping us process our memories, but it is also very important in helping to keep our immune system running at maximum capacity! Researcher Dr. Aric Prather explained, "Short sleep was more important than any other factor in predicting subjects' likelihood of catching cold. It didn't matter how old people were, their stress levels, their race, education or income." The New Rules On Sleep: How much do you need? 0-3 months: 14-17 hours each day (previously 12-18). 4-11 months: 12-15 hours (previously 14-15). 1-2 years: 11-14 hours (previously 12-14). 3-5 years: 10-13 hours (previously 11-13). 6-13 years: 9-11 hours (previously 10-11). 14-17 years: 8-10 hours (previously 8.5-9.5). 18-25 years: 7-9 hours (new age category). 26-64 years: 7-9 hours (no change). 65+ years: 7-8 hours (new age category). This new year, maybe it’s time to make sleep one of your health priorities! Not only can it keep you well rested and induce muscle growth it can also help process memories, improve cognitive functions, maintain a healthy body weight, maintain a healthy cardiovascular system, and also improve your immune system. Clearly, sleep should be at the top of your “To-Do” list this year! 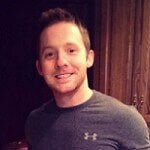 Josh Anderson (M.S., Personal Trainer) is the founder and editor of DIY Active: “Fit.Food.Life. No Gym Required.” He enjoys blending the latest science with fitness practices to help you exercise smarter.